As I say in my book “Effective HR Communication,” asking the “right” questions is key to designing a successful HR communications strategy. Keeping in mind that if you ask the wrong questions, you’ll get the wrong answers, how do you ask the “right” questions? By asking insightful questions, or “proper ones” (as Einstein says), you can challenge accepted models, turning the way you think of a situation or concept such as HR communications completely on its head. Ask open-ended questions. When you ask closed questions — ones that simply ask for a “yes” or “no” - you’ll undoubtedly end up frustrated by the response. So my advice is to stick with open-end questions as much as possible, starting off your questions with “what,” “why,” or “how.” By doing this you’ll provide an opportunity for the respondent to give information, opinions, or feelings. These answers are much more valuable in helping inform your communications strategy. Ask probing questions. In my book I talk about being a detective when asking questions, so put on your detective hat when you develop your communications strategy. 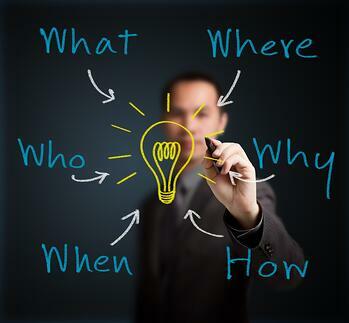 A great tool to use with probing questions is the ‘5 Whys’ method, which was developed by Sakichi Toyoda in the 1930s. (Yes, he also was the founder of Toyota Ltd.) This simple technique helps you get to the root of thoughts, concerns and/or problems by asking the question ‘why’ until you feel comfortable that you’ve identified the root cause, can identify a solution, or you can go no further. Sometimes it takes 5 questions, other times it takes more or less - the trick is to keep asking ‘why’ until you get the right answer(s). Ask funnel questions. Another technique which you may find helpful in asking questions is called the ‘funnel technique’. It has similarities to the ‘5 Whys’, as it asks probing questions; however, it uses a funnel approach by applying different words to get to the solution. You start with a general question (first part of the funnel), and then ask more questions (other parts of the funnel) to get more specific information to get answers to your question. Both are great techniques, and you can decide what will work best in your situation. Focus on a single attribute. According to Dr Andy Brown, CEO of Engage, “It is critical when asking questions to focus on a single attribute.” What he means here is to ask questions separately, not combining multiple questions. This is important because it keeps your employees focused on the question, it prevents them from confusing the various questions (and thus answers), and it also helps when you have to collate and analyse data. Begin with the end in mind. A final tip is to begin with the end in mind when asking questions, focusing on what you need to know to achieve your objectives and gain clarity. Don’t waste the time of your employees by asking questions which are of no use to your communications campaign or offer solutions which you are not able to fulfill. For example, if your company has a green policy regarding communications, you wouldn’t want to give them an option of using printed material when asking your employees how they’d like to receive communication material. A final tip for asking the ‘right’ questions, whether you use all or some of these tips and techniques, is to take the time upfront to think through exactly how and what you are going to ask. Put your detective hat back on, and prepare yourself for your ‘interrogation’, making sure you get exactly what information you need. By doing this you’ll collect the right answers, setting yourself up for effective and impactful communications.